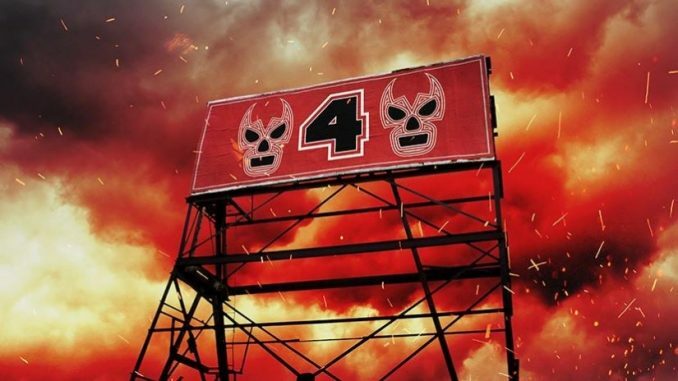 We have some notes from Friday night's Lucha Underground television tapings for Season 4, which is set to air later this year on the El Rey Network in the U.S.
Aerostar defeated Sammy Guevara & a wrestler I didn’t recognize, might be a LU regular. They set a funeral for Dario Cueto next by bringing out a picture of him to the ring. Melissa Santos led a moment of silence but was interrupted by Antonio Cueto, Dario’s father. The actor portraying Antonio is the same one who was portraying Dario only with white hair and a cane. He takes over the temple and announces an Aztec Warfare match. The Aztec Warfare match for the LU championship took place next. The trios champions started the match. Dante Fox wasn’t here so they replaced him with Son of Havoc. The Trios champions are now Son of Havoc, Killshot, and The Mack. Tommy Dreamer was a surprise entrant. Pentagon Dark won the match. Exolicious (an exotico) defeated Jack Evans. Pentagon Dark came out for an in-ring Promo. Brian Cage attacked him and said he will be the next champion. The next match was a Three Way To The Grave Match (Casket Match). Mil Muertes defeated Jeremiah Crane (Sami Callahan) and Fenix by placing them in separate caskets.